New year, new thread. In this thread we account for and keep track of our hobby stashes. What comes in (with a lot of creative rationalization for my part), what is used, and how to organize it. Actually a lot of the thread is just sharing our projects and talking about what we are working on. Come join us and share your stashes, your goals, your projects, your successes. I’m assuming there will be no failures in the new year. I’ve had several years’ worth of those in the last couple of months, enough to go around for everyone. So here’s to a bright new beginning - a whole new year before us to see what we can do with our stashes! My goals for the stash this year are to keep needlework additions to the minimum. I say this every year and it hasn’t worked yet, but this year will be different. It will! It will! Also since I now have a place to donate scarves, as many as I can make, I want to work on those all year and reduce my yarn stash. I really want to use up all the variegated I’ve collected over the years, so that is my first yarn goal. I have everything but my Red Heart in the attic. I’m going through that last night and today and keeping some of each color out. The rest of it will join the other yarn in the attic. It don’t need it all down here taking up valuable shelf space. I’ve moved the cross stitch stash and WIPs out of prime storage which is now given over to fabric and embellishments. Those of you from the 2018 thread know my goal this year is to work through a lot of fabric and embellishment techniques. Looking through the library I collected over the past months I have way more than a yea’s worth to learn. January will be for the last bits of unfinished stash organization, making a lot of pieced blocks to work with through the year, and playing around with seam embellishments. I have a printed foundation for a prairie braid, at least I think I remember that’s what it’s called, that will be perfect for that. I also have a set of 5” charms that I think will work for it. That’s plenty to start with. I plan to keep tweaking my sewing and work table space. It's all working way beyond expectations, so I don't anticipate any big changes, but one never knows. There's always room for improvements as new ideas occur. I also plan to keep working through the fabric stash I have had for too many years. Husby still plans to retire in the spring. One of the big projects we intend to tackle right away is getting the ceiling and insulation in the garage. We bought most of the materials for that years ago, and it has all been sitting there in our way ever since. Hopefully, it won't take too long. We also want to finish sorting and organizing in the garage, and get started on building up our garden and greenhouse area. We already have lots of materials for that project, too. Today I started sewing a couch quilt to surprise Husby with. It's going very well. I just have one more border to put on and then binding. I won't work on it tomorrow since Husby will be home, but I should be able to finish it later this week. Here's the front. It will get another gray border. 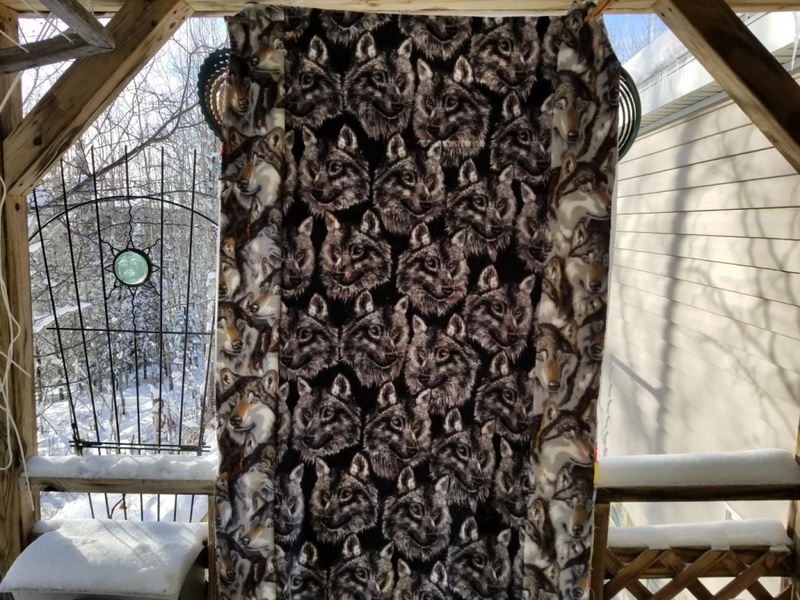 I love that I had these fleece remnants to coordinate with the wolf panels. Unfortunately I don't have quite enough, but I have another remnant to coordinate. I will make it work, and that will be 3 big chunks of stuff out of my sewing closet. so true! always the way with craft projects. That looks great SD. It’s fine to plan for spring projects but DH will probably just want to sit in a recliner and admire his quilt. The last (I think) of the lace and trim came today, as well as the beetle wings. They are gorgeous and larger than I expected, though the size was given in the posting. They are highly iridescent green, blue, and coppery gold. I bought the drilled ones so they should be easy to use. I’ll have to come up with a special project for them. A few days ago another cool thing arrived - the shed skin of a baby snake, a king snake if I remember. That’s going to need a special project too. I’m toying with the idea of turning it into the Loch Ness monster, but I’ll have to see how flexible it is. At any rate, I think that’s for the post doc project - lol. The sea urchin spines have been shipped and that will complete my collection of “bio embellishments.” I’m going to have so much fun this year! he is going to love it! my plans continued from last year is 3 fold ... 1. organize all my girl guide group crafts stuff, 2. the kids craft stuff downstairs and donate what is not needed or wanted anymore. go though my other craft items that are downstairs..shelving/storage got moved so needs a good dusting and sort. declutter. also products to finish. and a couple of gifts to make. finished a small blanket for xmas present for kids cousin so I can give it too her. but will say if you want it bigger give it back and i will make it larger like I planned. cus she is a teen. lusting after the new woolease yarn but have so much now that I am out of storage room for yarn..and can't say that I don't have lots! LOL! I guess I shouldn't mention the star quilt I finished in the last month or so. I cut and pieced the star at least 20 years ago. LOL, Martha, so true. Organizing and storage is an ongoing project here. If I could use up stuff faster it would help. At least I can still see the floor. 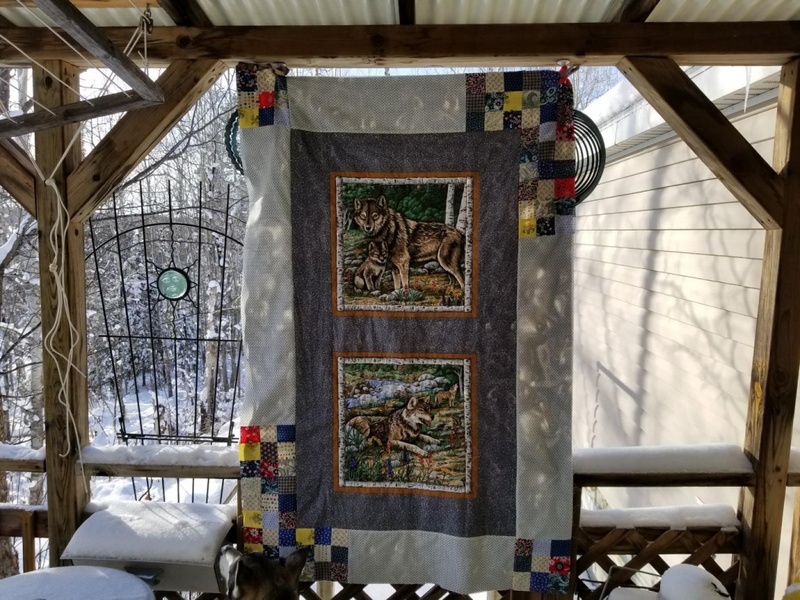 SD that wolf quilt looks great. Wonderful that you're able to pull it all together from your stash. DC, looking forward to what you do with the beetle wings. My goals remain the same: use stash, stop buying random stuff. I was bad about that in 2017 and 2018. New purchases for thread, batting, tools and notions allowed as needed. Other purchases only if it helps immediately finish a project (ie yardage for backing.) Priority this year is a new queen size quilt, I already have the fabric for the top. Not going to worry about the back until I get there. I want to continue to make charity quilts for local organizations, especially the veteran's program. Other than that, we'll see where the year takes me. Wolf quilt is looking great...hubby is going to like that a lot. I must say the sherpa throw I finished (from an old mattress pad) is SO WARM. It's like having an electric blanket on top of me. That was such a lucky find. I'll quilt at least 1 of the 2 old "inherited" full-size quilt tops. I picked the "pretty" (relative) one first. I still have a lot of fashion/clothing fabric to use. I'll work on the Singer 760 later in the year to get it running so SOMEONE can use it, even if it's not me. I need to buy less random stuff, too. The wolf fleece came from a garage sale. The owner had an entire single garage full of huge tubs full of fleece remnants and was selling them by the ridiculously low priced big bag. She had a business making fleece jackets to sell but was retiring, downsizing, and leaving the area, so she was highly motivated to get rid of stuff. The gray borders are some weird fabric. I can't recall where I even got that, but I'm sure it was cheap. The weird part is it was only 1.5 yards, but it's 98 inches wide. It worked out nicely for the wolves though. The other border is another piece I don't recall buying, but it was someone's leftover yardage. I still have quite a bit left of both pieces. My mom gave me the wolf panels. The 9 patch blocks are all scraps. I doubt I will have $5 in the entire wolf project. Waaa! My new templates may be delayed "due to weather or natural causes." My stuff was in Grand Rapids at 9 AM so apparently something happened between here and there. Hope no one got hurt. I was looking forward to cutting some stuff out tomorrow. The notice did say my stuff might arrive late, but I'm not holding my breath. I hope all the drunks make it home safely tonight. We are under a winter weather warning tonight with falling temps and bad wind chills. Good night to be home in front of the fire. 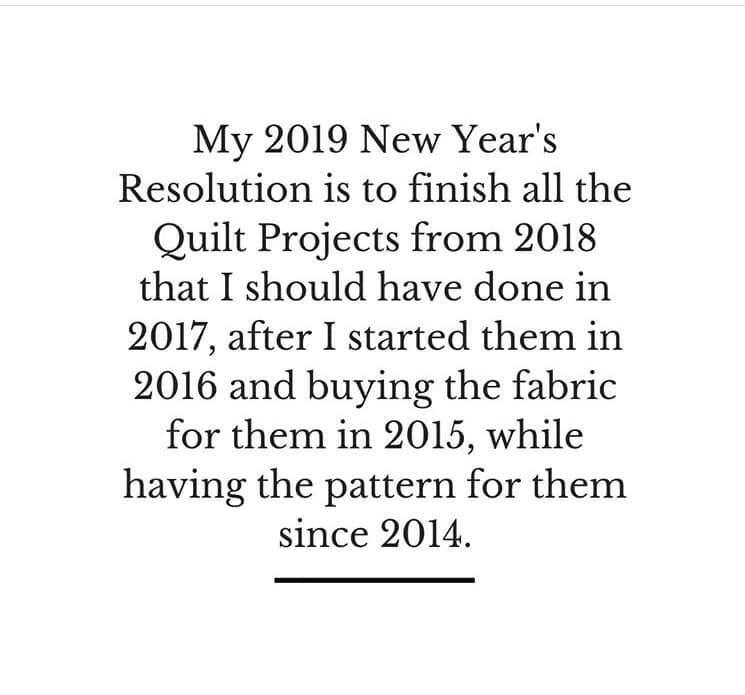 I like the idea the author suggests, to look for patterns based on available scraps instead of picking a pattern and then searching for the fabrics. I hope never to get to the level of stuff this person has, but will probably incorporate some of her ideas. I've already started cutting 2.5" squares as I generate scraps. Six stacks of those fit perfectly into one of my favorite storage containers, a cut down cat litter jug. It seems like a ton of things can be made with 2.5 squares. I liked the article. The first quilt I ever made was with tiny squares and I said never again. I don’t like sewing that much - lol. Count on me to start with something totally intimidating. I would love to start my fabric art year with something grand but I’m going to try to be more disciplined and remind myself often that every concert pianist began with hours of tedious scales. When I look at all that I need to learn to do what I really want to, I’m inclined to ask “how old will I be before I master that?” The answer of course is just as old as I would be if I didn’t. So the first set of scales will be embroidery stitches and seams. Scales to be sure but a necessary beginning. At least I can also play with some of the great threads I have that I also need to learn how best to use. Meanwhile I finished up a scarf last night that’s been going on too long at the rate of s few rows now and then. It was the slower pattern. Then to jump start the enthusiasm again I did almost a whole scarf with just plain dc. I’m going to churn out bunches of those. The kids won’t realize how lazy and plain Jane are. Anyway, fancy patterns get lost in most variegated yarns. With the ones with more subtle contrasts I might put a shell -like row up the center. I agree about the little squares being tedious, and I DO like to sew! But that's why I'm going to start by clotheslining all my squares in pairs. Then, when I feel like it, I will sew them together into 4 patch squares. Then 6 patch rectangles. After I accumulate some more different fabrics, then I can put the last 3 squares on. By doing it in stages, it probably won't be as annoying. I found out how much I hated doing it all at once when I just did the 10 blocks for the wolves, which is why I didn't do the last 2 once I discovered I needed them. I think my frustration with that process comes from my manufacturing experience. I hated laying all the blocks out, too. Maybe I'm doing it all wrong and overthinking. I do like the results though. I sewed the green velour pants, going to do hems by hand. Found enough hem tape in stash. Old sewing machine did not act perfectly, but better. I forgot I also cut out a skirt from left over dark blue velour. So I'll work on that next I guess. I finished using 2 spools of thread Sunday & today. I should be more active in this ( by actually posting instead of just reading, haha) I will probably pop in from time to time. I sew for others ( as well as for myself) and teach piano so going in 2 different directions all the time. I am probably not going to make specific goals. I have cut down on adding to my stash a lot though. 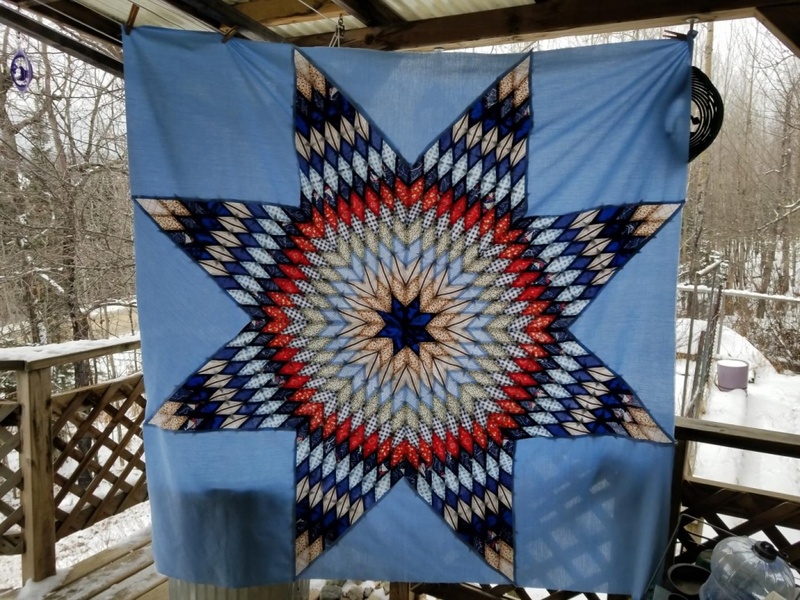 ( and that link you shared Spirit Deer, I have been following Bonnie Hunter for several years and try to make her quilts.) I have started implementing her cutting style and do find it easier to just go to the precuts for many of the quilt blocks she shares. but first up for me is a wedding dress alteration and make a bolero jacket to go with it for a wedding the first part of March. ( plus practice the piano to get wedding music ready for same wedding as I am also playing for it too) anyway. I hope to hop on more than I have in the past.